A Seattle City Council draft resolution proposes setting a base fare for transportation networking companies, which an Uber representative says would be the first such regulation in the country. Uber is rallying its passengers to oppose the effort. Uber told its customers Monday that the city of Seattle “wants to double your rates” in response to a draft proposal that could establish a first-of-its-kind minimum base fare for ride-hailing companies. The draft resolution, which will get its first hearing before the City Council’s governance, equity and technology committee Tuesday morning, calls for reviews of various rules and regulations that would impact not only ride-hailing companies – also known as transportation network companies (TNCs), such as Uber and Lyft – but also for-hire and taxi services. The renewed attention to the issue comes against the backdrop of an ongoing legal challenge to the city’s 2015 ordinance allowing TNC drivers to bargain collectively, and other efforts to resolve pay and benefits issues for the growing ranks of contingent and “gig” economy workers. The city does not currently mandate rates charged by TNCs, but it does set meter rates for taxis, currently $2.70 a mile. The $2.40 rate, while preliminary and subject to a public City Council process that’s only just beginning but calls for policy recommendations by the end of June, is not arbitrary. “That was the rate [Uber] charged in 2014,” Harrell said. He added that policy-makers need more data – another aim of the draft resolution – to determine whether drivers are being compensated fairly. Uber says Seattle would be the first city to regulate fares in this way. “Nowhere else in the United States is there a minimum fare for TNCs,” said Caleb Weaver, Uber’s public affairs manager in Washington state. Uber’s per-mile rate in Seattle on Monday morning was $1.35 — though that’s not what passengers see when ordering a ride on the Uber app. Instead, they’re given an upfront flat fare based on Uber’s estimates of the planned route. Passengers can click on a question mark icon in the app to see a breakdown of that upfront rate. Uber also pays drivers for each minute of a ride, and layers on additional payments related to promotions and times of higher demand. Uber representatives say drivers receive 75 to 80 percent of fares — depending on when they began driving for Uber — with the rest going to the company, along with a booking fee. Leonard Smith, director of organizing and strategic campaigns with Teamsters Local 117, which has sought to organize TNC drivers in Seattle, said standardizing a per-mile rate would benefit drivers. The rate structures of TNCs such as Uber and Lyft — let alone how they translate to actual earnings for people who are legally considered independent contractors, not employees — are complex and can seem opaque to drivers, he added. But the information has been harder for policy makers to come by. Last fall, Uber said the “median Uber driver in Seattle makes between $19 and $21 per hour before expenses.” Expenses range from $2.94 to $6.46 per hour, the company said. 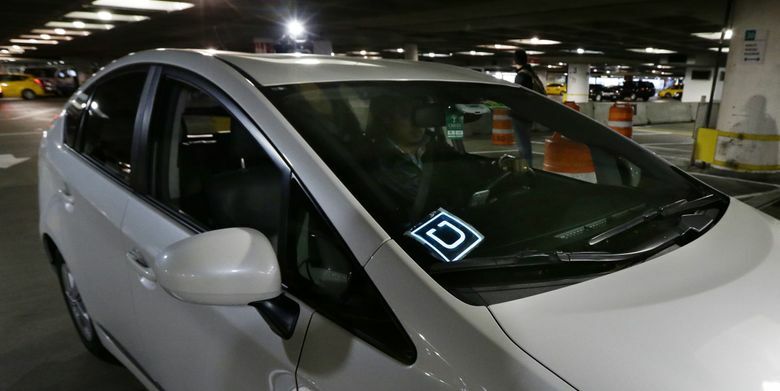 Uber has more than 15,000 Seattle-area drivers. Harrell said he’s heard from some TNC drivers who say their compensation has been falling, and some who say they earn less than minimum wage. “We haven’t been able to get hard data and the anecdotal data we get is conflicting,” Harrell said. His proposed resolution would point the council toward legislation aimed at gathering more data from the industry to inform its policy making. Specifically, it would require data on fares, hours worked, number of drivers and driver compensation from all market participants. In drafting legislation, the City Council “will explore creative ways to address the concerns of market participants about the release of data,” the resolution says. For Uber, those concerns include large amounts of raw data that could be accessible to competitors through public records requests. Weaver said he’s “optimistic” about a solution and cited the University of Washington’s Transportation Data Collaborative as a potential opportunity. Jan Whittington, director of the Urban Infrastructure Lab at University of Washington, helped form the collaborative group about a year ago to conduct protected research on location data, which she said she treats as sensitively as medical data. “There is a tension between the sensitivity of this data, the need for public agencies to have answers to their pressing questions about how to govern public rights-of-way, and the needs that firms have for their business competitiveness in the data,” Whittington said. The collaborative has been safely and securely housing data from the city of Seattle’s dockless bike-share pilot program for about a year. It’s unclear whether funneling the data through the UW would shield it from public disclosure under a research data exemption in Washington’s public records law.